We are the top-rated Fontana insurance company for good reason. Red Line Insurance Services offers our clients a variety of options when it comes to insurance coverage, from auto insurance to tax-deductible insurance to homeowners insurance to business tax services to life insurance as well. It’s safe to say that we’ve got you covered. In our last post, we took the time to highlight and detail each of our insurance coverage types. For example, we explained how we often help business owners find tax-deductible insurance solutions. From group healthcare insurance to fidelity bonds or casualty insurance, there are plenty of ways we can brainstorm to help you stay above the red. With over ten years of experience in both the insurance and tax fields, we understand they can work together to provide you with a sustainable, actionable plan. However, today’s post is focused on our readers who have been classified as “high-risk drivers”. In the state of California, drivers who have been convicted of a DUI are often classified as high-risk drivers. However, there are other ways someone can receive such an infelicitous title. Although the situation might seem bleak on the surface, take heart! You might have options. 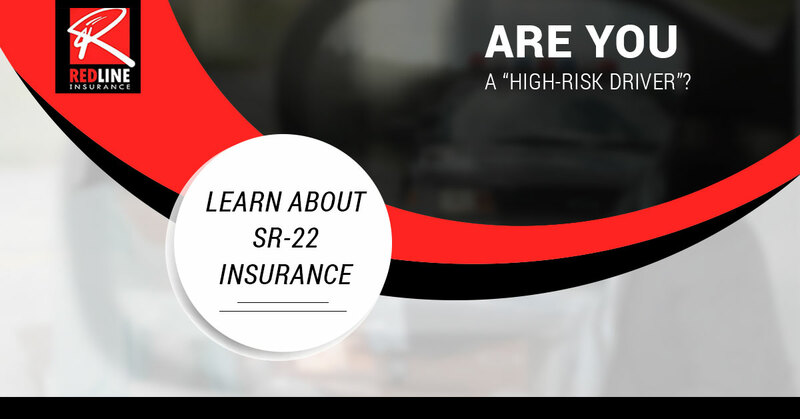 SR-22s are vehicle liability insurance documents that the state of California’s Department of Motor Vehicle requires in order to get a high-risk policy. Also called “certificates of insurance” or “financial responsibility filings”, SR-22 might be required for up to three years if someone has been convicted of driving without insurance or with a suspended license. In cases involving a DUI, the maximum is five years. SR-22s usually cost somewhere in the range of $15-25, all things being equal. That is a reasonable price to pay when you consider the fact that you’ll need one to be able to legally drive! An SR-22 filing must be issued by an insurance company. And, likewise, the insurance agency is the party that cancels a policy if an SR-22 expires or is canceled. However, you don’t need to worry about one more added step in your journey to getting car insurance – we’ll simply include it in the high-risk auto insurance policy. As is the case any time you work with us here at Red Line, we’ll make sure the process is straightforward and direct. The less time you need to spend worrying about auto insurance policies and the more time you can be back out on the road, the better! If you are ready to speak to a representative at Red Line Insurance of Fontana, California, please don’t hesitate to reach out to us. There is no obligation, only a free consultation to schedule. We are completely dedicated to resolving all problems you might have in addition to working with you to help you formulate affordable, effective insurance and tax strategies. Contact us today!